Highlights of the last few weeks have focused on areas of special interest here in Inishowen; in terms of modern film making, celebrating our spectacular coastal scenery, natural phenoneoms like the Northern Lights, and our deep and rich historical links to a land of an undiscovered kingdom. 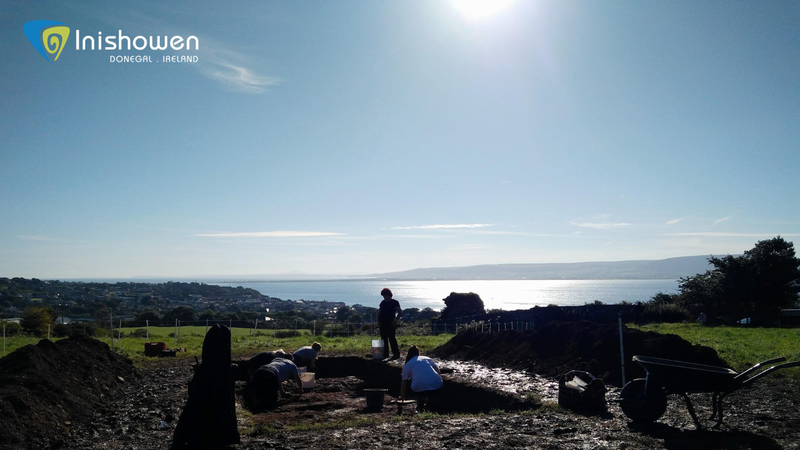 The Lands of Éogain group returned to the Peninsula to continue their work uncovering yet more exciting finds at several locations in Inishowen. The Peninsula’s archeological research into its fascinating historical past is now being revealed through the collaboration of heritage groups throughout Inishowen. The Colgan Hall provided a venue to hear speakers from Ireland, England, and Scotland giving factual information to the community about the connections with Iona, Lindisfarne and Pictish Portahomack. 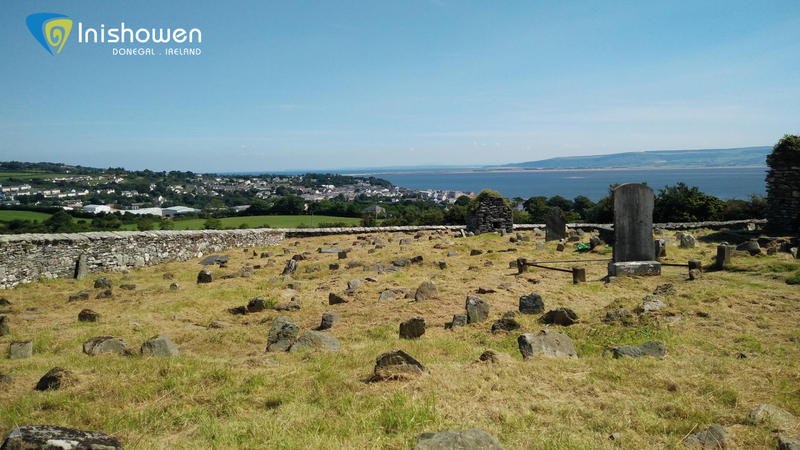 It was an opportunity to share their exciting discoveries from the dig at Cooley Graveyard and the Geophysics survey at Carndonagh; the results of which were eagerly awaited by the audience at the Carndonagh Library on Thursday 24th of August. As a non euthuasist to be perfectly honest in archaeology I was sat amongst the well informed experts of this field, however immediately became gripped in the subject area from beginning to end in the talk that ensued that evening. I found myself excited to see that Carndonagh was in fact to be revealed as having the distinct hallmarks of an early monastic site. One of the two geophysics specialists Jack Pennie stated “Although there’s nothing to be seen on the ground, we can clearly see the outlines on the computer images, and if you trace the curve around the Marigold Cross it is bang in the middle of it”. This type of outline is associated with what was explained as a double circular precinct that confirms the origins of an early monastic site. On Sunday 21st of August, Failte Ireland’s publicity representative Jane Stokes met up with me at Malin Head to walk the spectacular coastal trail that was associated with the theme they were covering in the Northwest of Ireland; T.V & Film locations in Ireland. The group from Dubai took a bike ride with Blaise Harvey (Cycle Inishowen) from Farren’s Bar, and then the Dubai Media team of journalists were given an opportunity to meet some of the locals. A huge thank you to Hugh Farren of Farren’s Bar for taking time out on a Sunday to give an overview of the hype that accompanied the experiential experiences associated with the filming of Star Wars here in Malin Head. 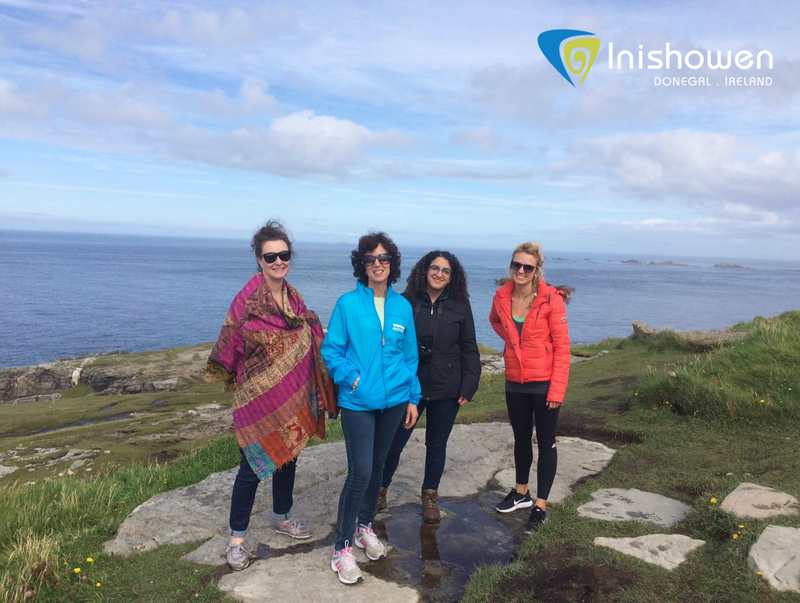 What I feel we do best in Inishowen is that we go above and beyond to meet the visitors/tourism industry needs and that this is a clear representative of all our tourism providers in the Peninsula. It continues to be why people tell us they will return. Coming soon is another rich cultural event centred in the area of Culdaff. The weekend of Saturday 10th of September sees the First Nations Event come to Ireland. The Inaugural event is centred on adventure sport/health and wellbeing with music and keynote speakers. Themed speeches include: “Duchas- Mapping Our Minds” and “Invasions- Irish Histories & Her Stories”. This event is based around the shared values of the indigenous people and how these values connect with the culture and origins here in Ireland. There are a group of Maori visitors expected to take part from New Zealand and other various locations. Events are organised in conjunction with Far and Wild (NorthWest’s leading Eco-tourism company) based in Derry and supported by local representatives from Inishowen. Full details are on www.firstnationsireland.wordpress.com alternatively on events www.visitinishowen.com or www.facebook.com/visitinishowen. I would encourage anyone with an intrinsic interest in the shared values of our Irish culture to come along and avail of a unique opportunity to learn and connect with our visitors from faraway lands.